Tao G. Vrhovec Sambolec is a sound artist and musician based in Amsterdam and Ljubljana, working with the invisible ephemeral phenomena on one hand and the notion of space on the other. His artistic practice is a poetic exploration of relationships between transitory and temporal flows like sound and weather phenomena and architectural and social spaces they inhabit. In his installations, he makes architecture sensitive to its immediate ephemeral surroundings and enhances the temporal dimension of architecture by creating situations where the outside and inside, the unpredictable and constructed, the permanent and temporal, time and space converse. His works encompass interdisciplinary and mixed media installations, sound interventions and electro acoustic music. Born in 1972 (Ljubljana – Slovenia), he received BA – main subject clarinet – at Trondheim Music Conservatory (Norway), BA in music composition and MA at Interfaculty Image and Sound – ArtScience, both at The Royal Conservatory in The Hague – The Netherlands, where he also followed Sonology course. He was commissioned pieces by Barton Workshop Ensemble (Amsterdam), Percussion Group The Hague and Slovenian Cinematheque. 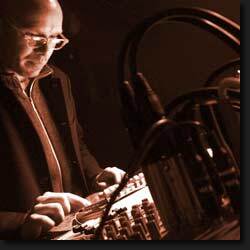 He is founder of international cycle of sound events, lectures and workshops Bitshift in Kapelica Gallery – Ljubljana, which started in 2001. In 2008 he got awarded Startstipendium from The Netherlands Fundation for Visual Arts, Design and Architecture – Fonds BKVB. In 2010 his work Virtual Mirror – Rain got awarded Hybrid Arts Honorary Mention at Ars Electronica, Linz, Austria.